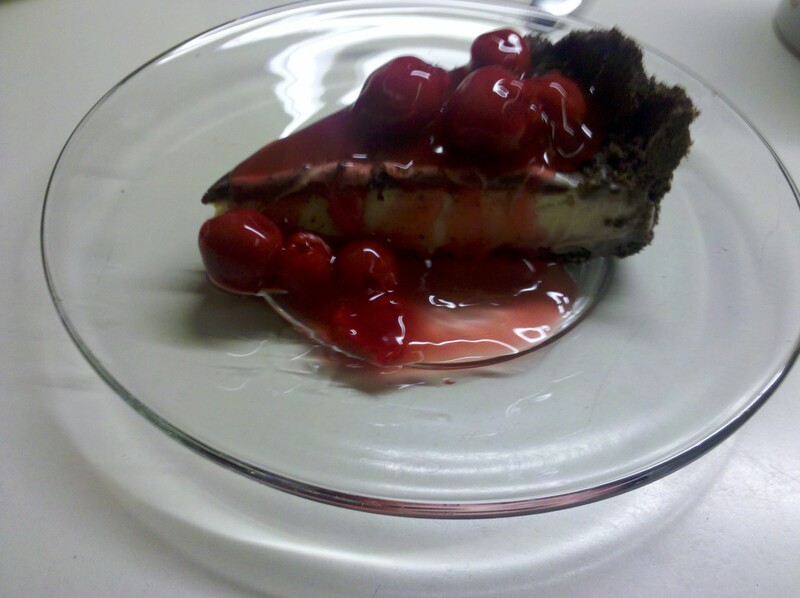 This entry was posted in Photos, Quotations and tagged Charles Dickens, chocolate, dessert, friend, friendship, photos, quotation. More than anything Yoon wants to fit in at school and make friends, so what she desires for her birthday is a jump rope. Yoon believes that the children will let her play jump rope with them and she’ll finally have some friends. 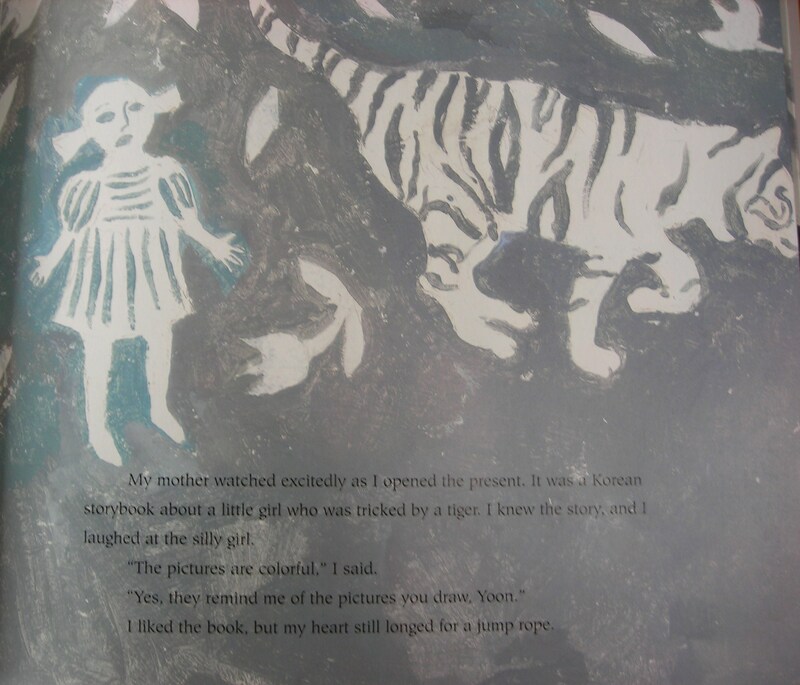 When it is her birthday, Yoon’s mother gives her a Korean story book about a little girl who tricked a tiger. The special present Yoon receives is a jade bracelet that was her grandmother’s. Symbols inside the jade bracelet mean Shining Wisdom. Neither present is a jump rope, but Yoon pretends to be happy. 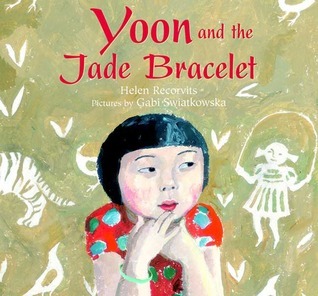 At school a girl notices her jade bracelet and tells Yoon how beautiful it is. If she lets Yoon wear it the girl promises to be her friend and she can jump rope. Yoon knows deep down that she shouldn’t give such a special item, but she finally lets the girl borrow it for one day. 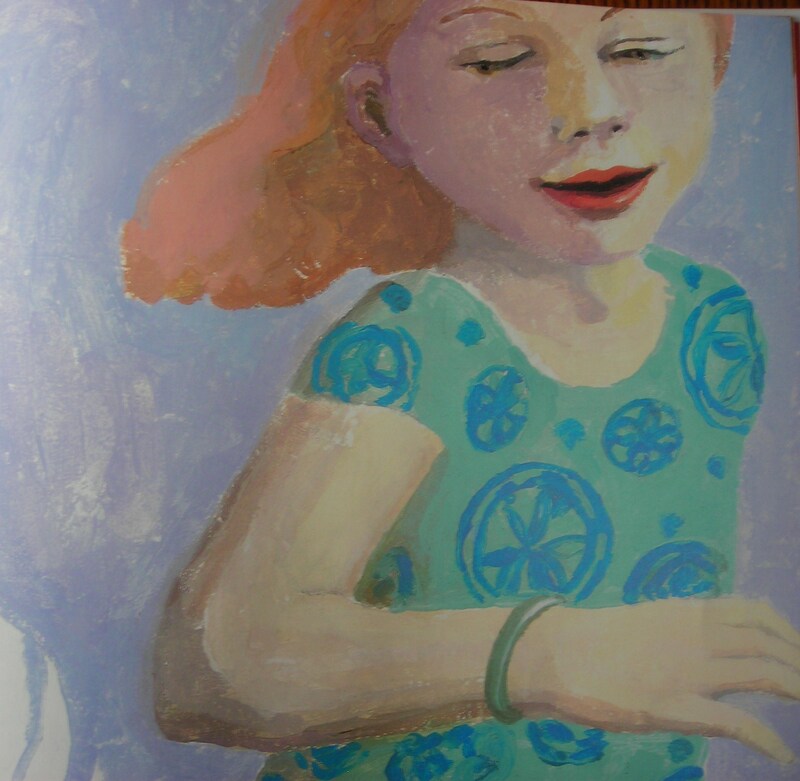 However, the girl doesn’t give it back and Yoon’s mother believes she lost it. Yoon begs to have her jade bracelet back and tells the teacher it is hers. The teacher asks Yoon how she can prove it is hers. Yoon whispers that inside it is written Shinning Wisdom, but the other girl can’t tell what it says. Yoon gets her jade bracelet back and is the tiger who tricked the girl. 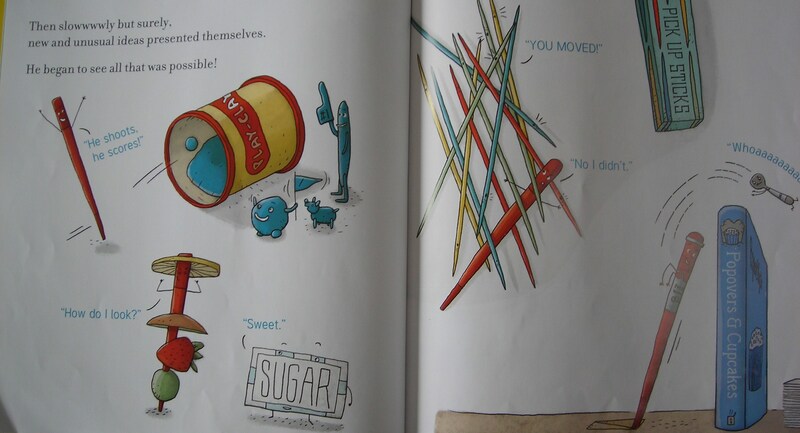 I really enjoyed Yoon and the Jade Bracelet, since you may not see this type of bullying often in books. 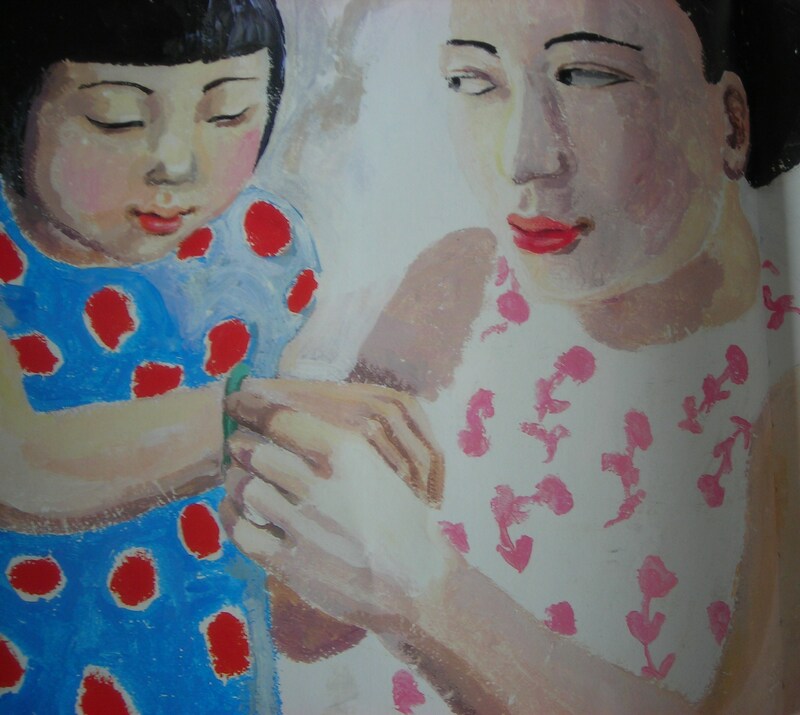 It shows the cultural importance between her mother. Yoon is the same character from My Name is Yoon. 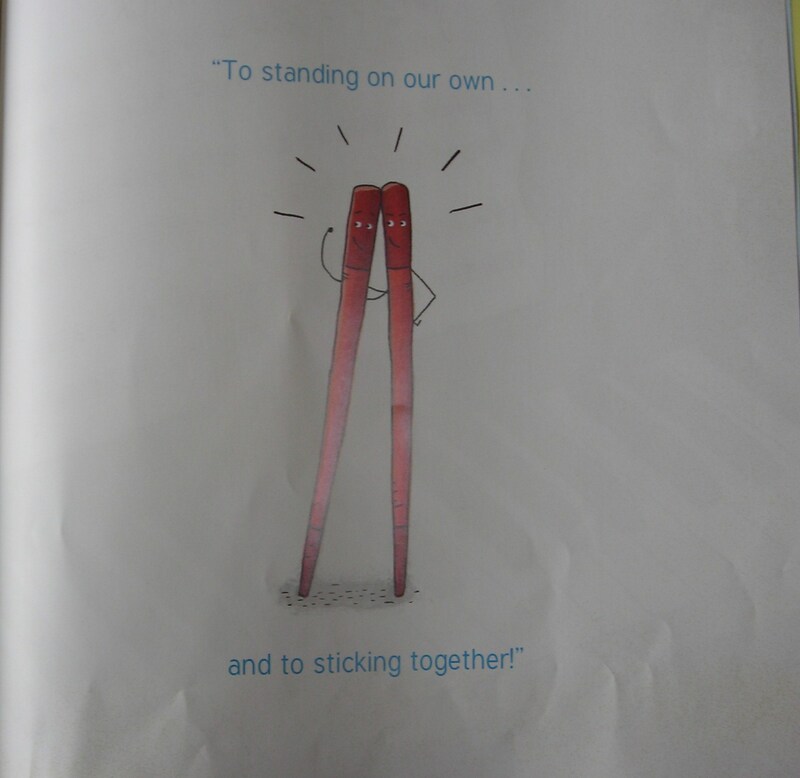 This entry was posted in Ages 6-8, Book Review, Children's Book, Picture Book and tagged Book Review, bullying, children's book, cultural, friendship, Gabi Swiatkowska, Helen Recorvits, picture book. This week’s photo challenge is friendship, which is the perfect challenge. 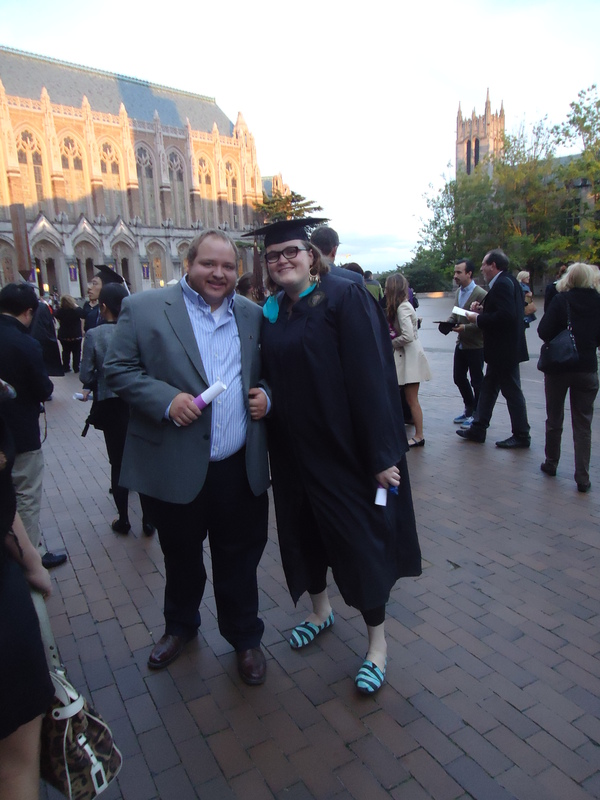 My sister graduated yesterday from the University of Washington. On such a special day you are surrounded by friends. Check out her artist information HERE. 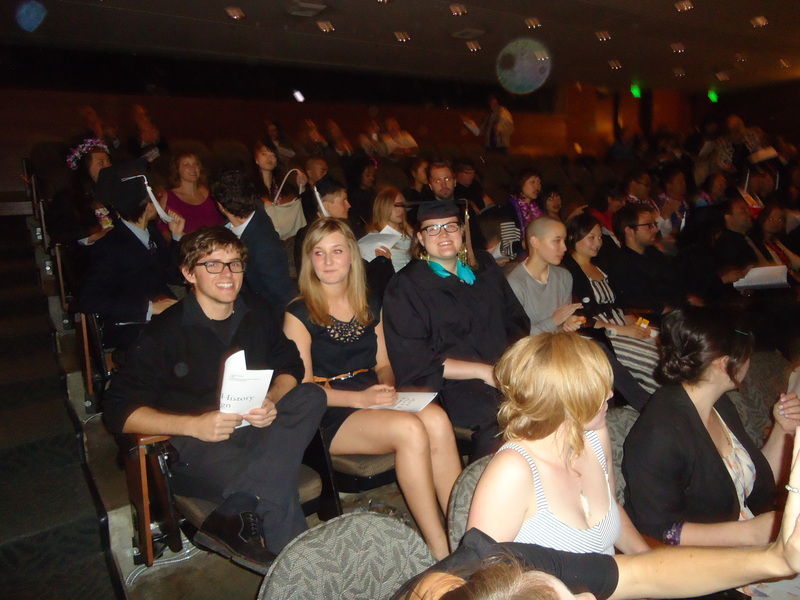 My sister is the one with great earrings and is smiling. This entry was posted in Photos, Weekly Photo Challenge and tagged friendship, graduation, photos, University of Washington, weekly photo challenge. 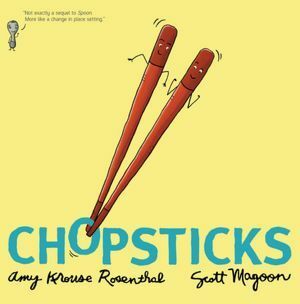 If you haven’t already heard about this unlikely friendship then this will surely make you smile, even though there’s a sad mention in this post. Tarra performed in the circus as the only roller skating elephant. In 1995, Tarra came to the Elephant Sanctuary in Tennessee. Unlike a zoo where animals remain in cages, the elephants in the wildlife sanctuary roam freely throughout 2,700 acres. All the elephants except for Tarra found an elephant companion. However, that changed when Tarra awoke to find a stray dog next to her. Soon Tarra and Bella went everywhere together. One day, a caregiver found Bella injured in the grass and was taken to the vet. It was unsure whether Bella would be able to walk again, since she had a spinal cord injury. 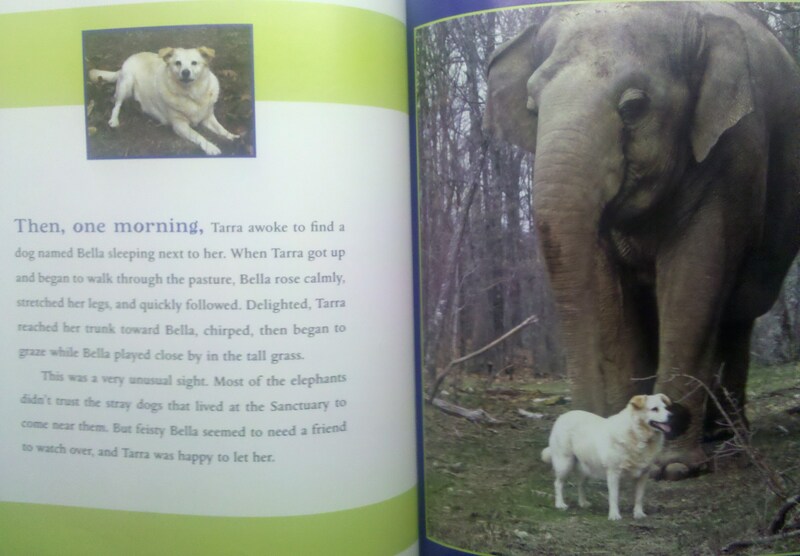 Every day Tarra remained in the same spot waiting for her friend and finally searched to find Bella. Tarra waited outside for her friend while Bella rested. When Bella discovered that Tarra was outside, she attempted to run to the window. Finally, the caretakers realized that the two desperately wanted to see each other so they carried Bella to reunite with Tarra. 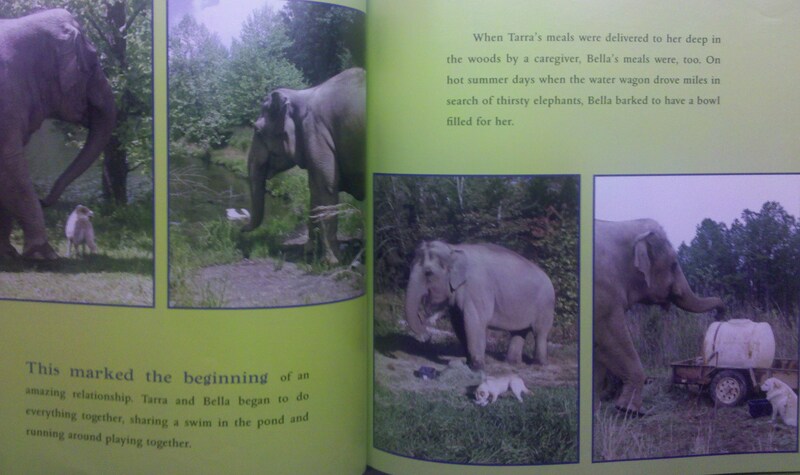 Tarra welcomed Bella with gentle elephant trunk pets. Tara returned each day until Bella was well enough to roam. Sadly, Bella died in October 2011. 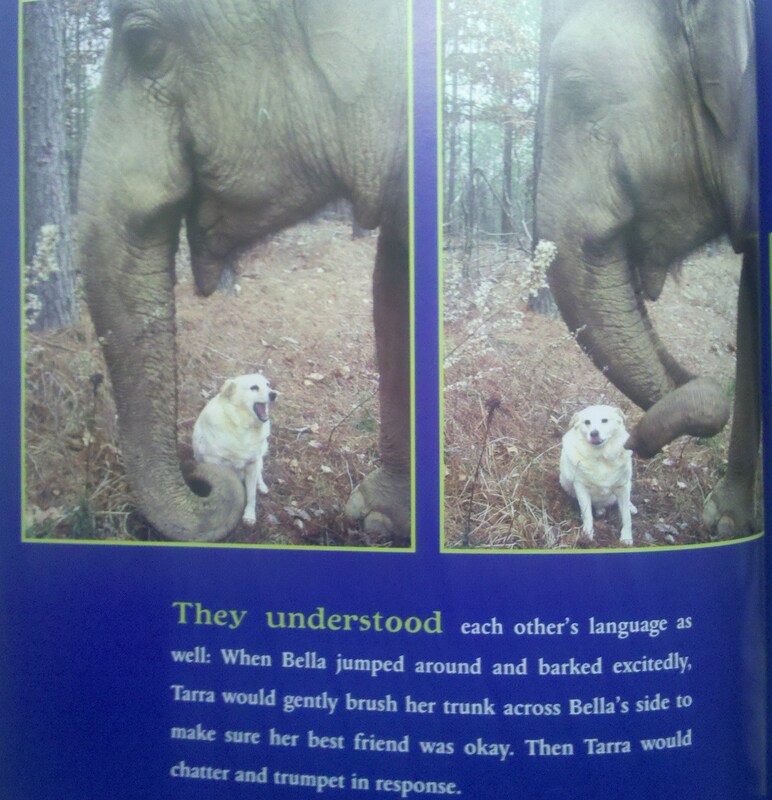 The friendship between an elephant and dog prove that we can look beyond any differences and understand each other. The back of the book provides information about the Elephant Sanctuary. 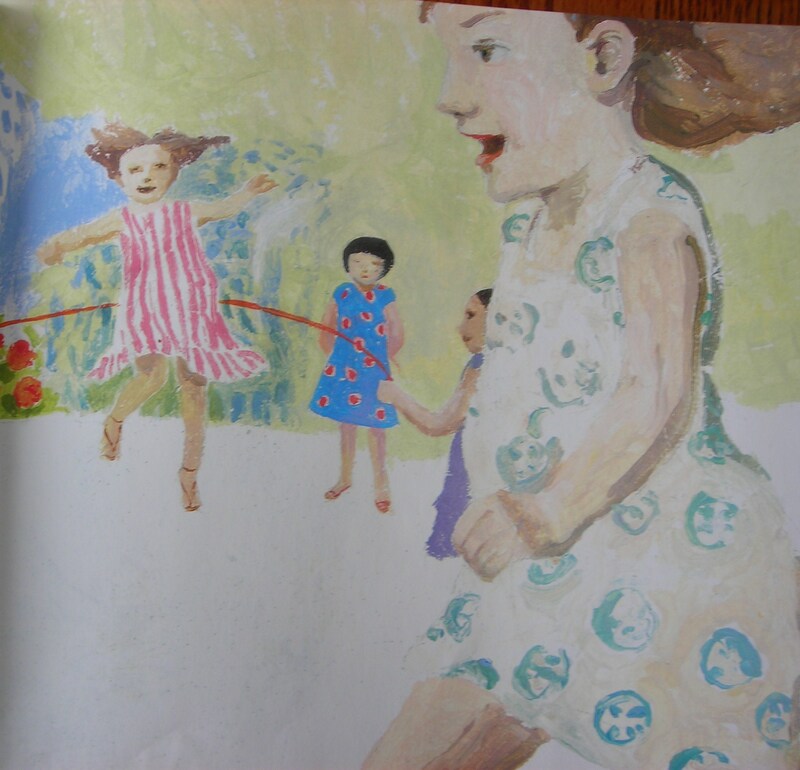 This entry was posted in Ages 6-8, Ages 8-10, Book Review, Picture Book, Video and tagged Book Review, Carol Buckley, dogs, Elephant Sanctuary, elephants, friendship, picture book, Tarra & Bella: The Elephant and Dog Who Became Best Friends, video. It should have been the perfect summer with his sister away and a new tree house, but it wasn’t turning out to be a perfect summer. 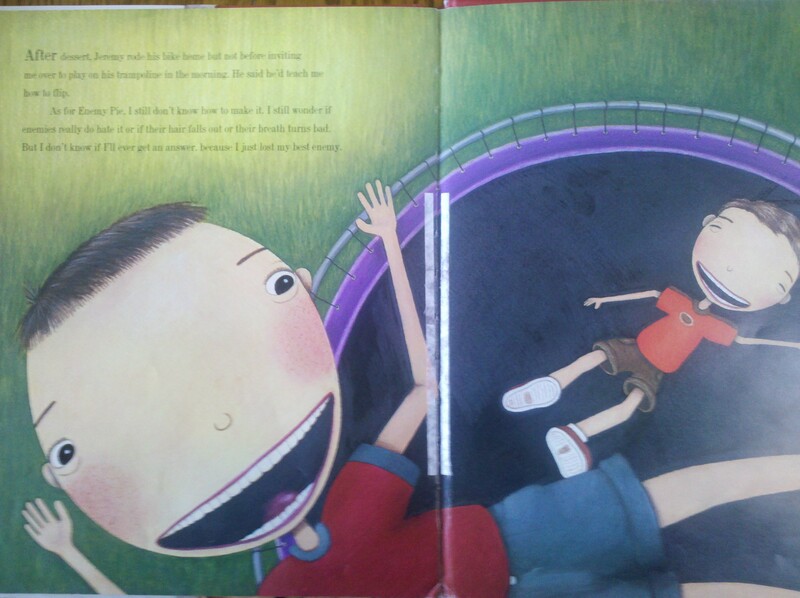 Jeremy Ross was the reason for a not so perfect summer, because he laughed at him during baseball and invited everyone else to his trampoline party. Jeremy Ross becomes the first and only person on his enemy list that he posts in his secret tree house. Well, his dad understands enemies and explains that he has the perfect pie recipe, but in order for it to work you need to spend the day with your enemy and be nice. Jeremy and him ride bikes, play basketball, and even hang out in his secret tree house. 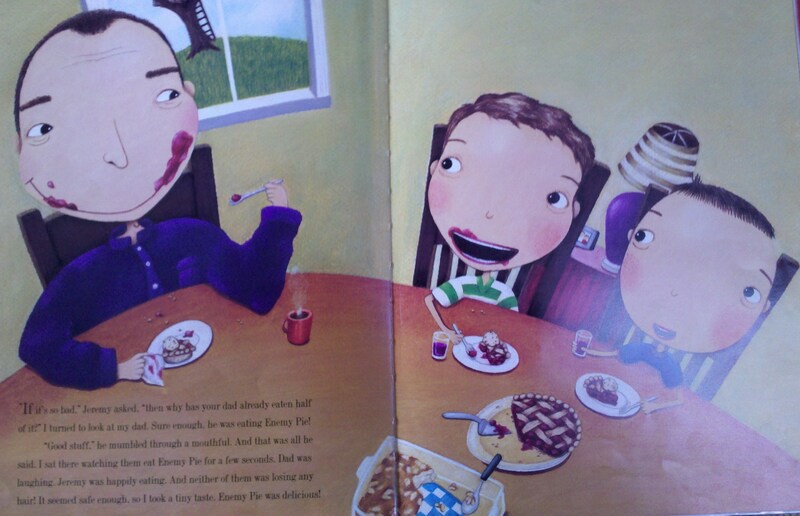 However, he becomes frighten about the enemy pie when his dad offers some to Jeremy. 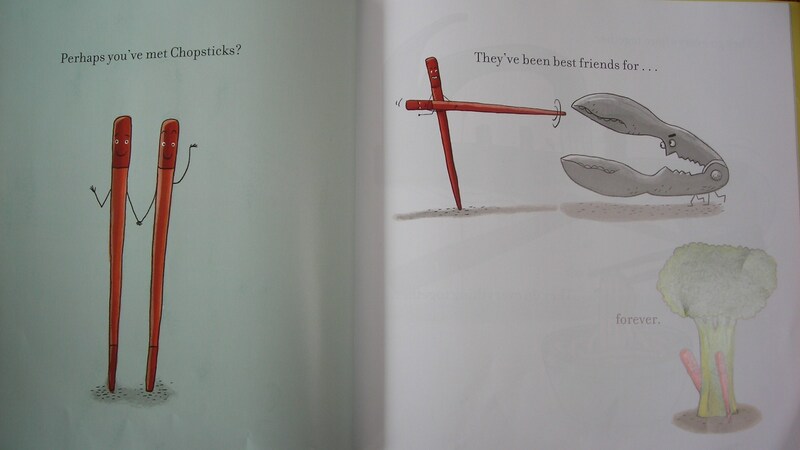 It turns out that the ‘recipe’ for getting rid of your enemy is to treat them like your friend. 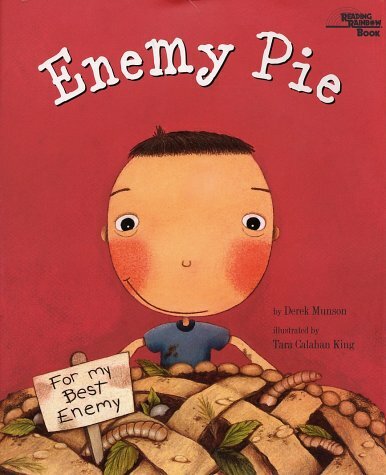 This entry was posted in Ages 6-8, Book Review, Children's Book, Picture Book and tagged Book Review, children's book, Derek Munson, enemies, Enemy Pie, friendship, picture book, postaday2011, Realistic Fiction, Tara Calahan King. Do you have your ticket ready at exactly eleven o’clock on the first of September standing upon platform nine and three-quarters? I hope so. Many schools start today, so I remembered what occurs on the first of September in Harry Potter. 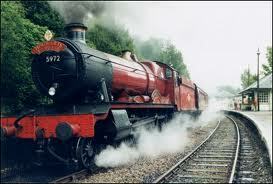 Travel back to the beginning as Harry boards Hogwart’s Express for the first time. Of course, since he lives with muggles they laugh when he mentions that the train leaves from platform nine and three-quarters when to them it doesn’t exist. Harry wouldn’t believe that so very soon he’ll begin his magical journey and lasting friendships. Harry felt a great leap of excitement. He didn’t know what he was going to – but it had to be better than what he was leaving behind. We’ve all had similar feelings of excitement and apprehension about the journey ahead. Besides brief chats with Hagrid, Harry had no knowledge about the wizard world. What situations have put you into the unknown? Harry’s completely alone until he stumbles upon the Weasly family who help him through the brick wall and onto platform nine and three-quarters. What or who has led you through struggles of unknown? I love that this is where he meets Ron and during this casual conversation they become instant friends especially to Harry who’s had no true friends. 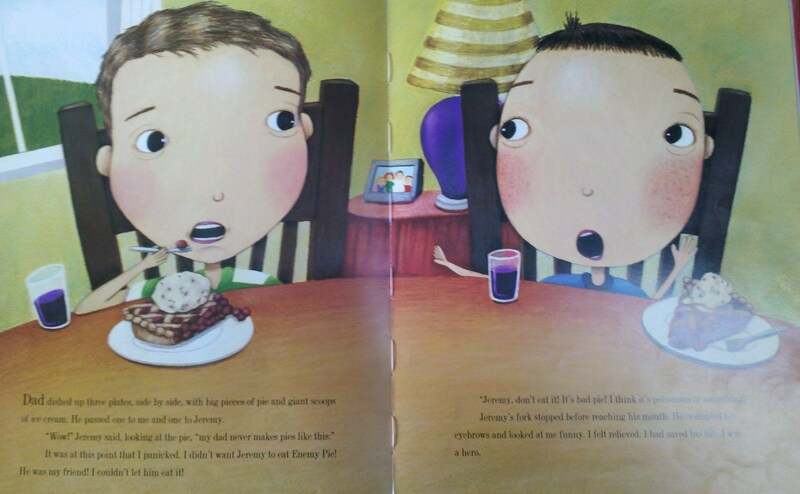 “Go on, have a pasty,” said Harry, who had never had anything to share before or, indeed, anyone to share it with. It was a nice feeling, sitting there with Ron, eating their way through all Harry’s pasties, cakes, and candies (the sandwiches lay forgotten). It’s the people we meet along the way that make the journey worthwhile. Sure, Harry may have joined a different compartment but they may have made him a different person. Ron gained recognition, since Harry saw him as an individual and not the many from a large family. 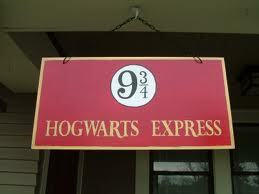 Hopefully, I’ll be meeting you abroad Hogwart’s Express as we buy sweets and start our journey together. This entry was posted in Harry Potter, Writing and tagged adventure, friendship, Harry Potter, hogwart's express, J.K. Rowling, King's Cross, platform 9 3/4, postaday2011, weasley.